Several weeks ago we went down to Ennis to see the Bluebonnets and Indian Paintbrushes, driving down some of the narrow trail roads to see the fields we came across one that could have been the subject for many of the French Impressionist painters ~ and who knew, in the middle of Texas! 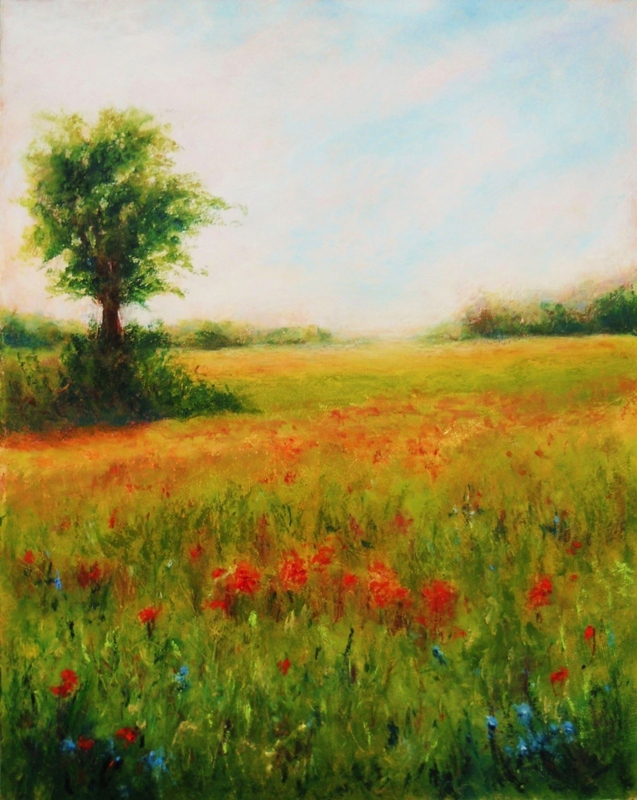 A Field of Indian Paintbrushes, (14×11) is an oil pastel painting done on a gesso-prepared hardboard. The scene captured my attention immediately, as picturesque as one could imagine I knew this would be my first oil pastel painting after taking a long hiatus from the medium. I took several photographs of the area, each one a painting in itself. The field had mostly Indian Paintbrushes with a few Bluebonnets showing up here and there in the foreground. The painting was started with a warm acrylic underpainting done in a combination of cadmium red light and yellow ochre for the sky and field, for the tree a bit of dioxazine purple was added. I was hoping that some of the colors would peek through under the oil pastel paints – I was not disappointed. It took a little while to get used to painting with color and oil pastels (the sticky wetness, for spreading, making marks, scratching and blending), but in no time it all started coming back. I may try my hand at this particular scene again without the underpainting for a different overall feel to the scene. Thanks for checking in ~ was great painting with color again! Click onto the image for a larger view. This entry was posted in About Oil Pastels, OPs New Paintings and tagged art, fine art, impressionist, indian paintbrushes, landscape, Oil Pastel, painting, pastel, wild flowers. Bookmark the permalink. Thank you very much Ana! Thank you so much Leyla! Hi Heath, thank you so much – very kind of you! Hi Rita, thanks very much! It’s been great painting again, a nice change of pace from B&W drawings. Another beautiful work of art, Mary. Well done. Thank you Cynthia – appreciate your kind response to this painting. Thank you very much Resa! I liken this to a Monet. Dreamy abstract of a hazy meadow. The reds pop above the encroachment of blue. It is lovely. Thank you so much Holly for your lovely description and feedback – I thoroughly enjoyed it! Thank you Robert – I tried something a little different by using a warm underpainting, glad you enjoyed!! Stunning! I love Indian Paintbrushes, which bloom much later here in our part of the world. This is a lovely and tranquil scene. Did you have an outdoor picnic on this trip? What a beautiful place for it. Beautiful painting….I have been interested in oil pastels but they never look as good as what you do! You bring the medium to a whole new level! I am so glad that I ran into your blog. Thank you so much Margaret, very nice to meet you. Appreciate your kind thoughts and compliment – oil pastels is a great medium, so often misunderstood and not recognized for the results that can be produced. I have already been planning my attack….get a small set and go from there. 🙂 soft pastels affect me especially in the art room, been thinking about this for a long time. Not sure if I will ever stop using them but would like to cut down my exposure to them. I understand, I tried soft pastels as my first painting medium and it took two months of coughing and sneezing, to walk away from them. If you try oil pastels get artist quality (student quality has a lot of wax and can be difficult to move around). I have a couple of posts about the medium under categories of posts, that might help in selecting some brands. You’ll really enjoy the freedom of painting with OPs. Oh my that is really scary, softies have a dangerous element. Ops offer a healthier alternative, hopefully. A beautiful painting Mary! I love the impressionists. Thank you so much Karen – appreciate it! Thanks so much Jo. The land was ablaze with these beautiful flowers, you would have captured some awesome scenes with your lens. Hi Mary. This is an a gorgeous piece. The colors are so intense. Very well done. Hi Kerry, great to see you. Thanks very much – I was a little apprehensive once the warm underpainting went down, but overall worked out with the blue sky and bluebonnets cooling it off a bit. I would love to sit under that tree and scribble in my notebook (or my laptop). Great work. Thanks very much Tim, so glad you enjoyed the painting. Scenes like this always inspire, it was a real gem we found while driving around. Thank you Fiona for your kind thoughts. Thank you so much Judy for your thoughts and compliment. Glad you enjoyed!! I always enjoy your oil pastels and I love underpaintings! The warm glow of your underpainting gives such an amazing atmosphere, really well done! Thanks so much Alexandra – the underpainting really added to the atmosphere that I was hoping to achieve in this painting. Thanks for noticing and commenting. Wow! This painting has a magical quality, as it seems to glow from within! Wonderful, Mary! I love the detail you capture and the warmth emanating from the foreground. Well done! Nice to see you posting your work again! Thank you so much Laura for your beautiful thoughts on this painting. The entire Town of Ennis had a magical quality about it this year with the awesome fields of wildflowers – difficult not to fall in love with gorgeous color everywhere you looked. Thoroughly enjoyed working the foreground with thick paint and a painters knife. Thanks again – hope you have a wonderful week. Mary, this is spectacular. As I was reading your experience I was growing in anticipation of seeing what you described and am blown away by the beauty of it and your interpretation. Just beautiful!!! Thank you for sharing it. Hi Catherine, that you so much for your generous and kind comment. You would have loved this particular field of flowers, the colors were magnificent this year – I can just imagine the painting you would have produce from something so beautiful. Thanks again! Happy to see you again Janet, hope you are well. Thanks very much for your generous comments and compliment – can you imagine my excitement when I saw this one field. Really took my breath away and very happy that the oil pastels cooperated in producing the vibrant scene I envisioned. Thanks again and hope you have a wonderful week. I also opened the photo up. Gorgeous painting delightfully done. Love it. Thanks so much and glad you viewed the image in a larger size to see the details. Appreciate your lovely thoughts on this painting. This one sparkles with life. I love it. Thank you Dorann – I’m glad you enjoyed the painting! Thanks so much Frank – appreciate your compliment!! Absolutely a pure delight to see you using your oil pastels again. I love this painting! The red flowers really pop and I think your underpainting in purple was a great idea to bring harmony throughout. Thanks so much Rhonda – was great capturing in oil pastels. The Indian Paintbrushes were that bright in person, can you imagine – just a gorgeous scene. I thought that the underpainting would help to give an overall warmth to the painting, and the final addition of purple worked as you said for harmony. Thank you for noticing and commenting on it. I was really happy working those oil pastels again. So beautiful. I really like the warmness of the colors. A stunner. The underpainting shines through. This just glows with joy. Thank you so much Cynthia – appreciate your kind thoughts. Underpainting worked – looking to try this scene again. Thank you my friend – it’s time for brighter days. OMG this is gorgeous Mary. My neighbor wants to kill her plants like this I said please can I have them 🙂 Happy Mother’s Day! Oh Eunice – you know how to make my day! Thank you my friend. Go get your neighbors flowers, seed your yard they’ll grow no doubt under your wonderful care. Thank you Sylvia for such a beautiful comment – was a pretty scene to come upon. glad you enjoyed! What a lovely thing to write Amy – can’t thank you enough. And I’m glad a few little blue bonnets did sneak into the foreground! Thank you so much Cynthia for such a beautiful comment and compliment – it was a scene that I thoroughly enjoyed bringing to life under the vibrancy of oil pastels. You would have had a good laugh, it was so warm in the studio that the little bits of oil pastels were sliding all over the place and by using Senneliers the gritty texture really got used up pretty quickly – well, it was an interesting time painting to say the least but fun none-the-less. Interesting question, sometimes it makes a difference – all depends on the subject and whether I can feel the scene that’s staring back at me through the photograph. There are some photographs that I take and I feel nothing, and then there are scenes that someone else has taken that blow me away (ocean scenes) and it’s as though I’m standing right there feeling the sun/warmth/cold, etc. it all depends. In the case of the TX landscapes photographs that I took down in Ennis, there is a special feeling that I get by looking at them and I’m transported right back to the place. Wow! That’s beautiful, Mary. The detail makes it look like a photograph. Lovely! Thank you so much Jill – this was a neat landscape that translated perfectly into a painting. Coming across this place was a real treasure, because it was on a road that we weren’t going to drive down – I didn’t realize how amazing the shots turned out until I looked after we were well on our way home. Really appreciate your kind thoughts. Thanks so much Sibella – love your reaction to the scene! I can’t contain my excitement when I see a beautiful artwork that moves me. 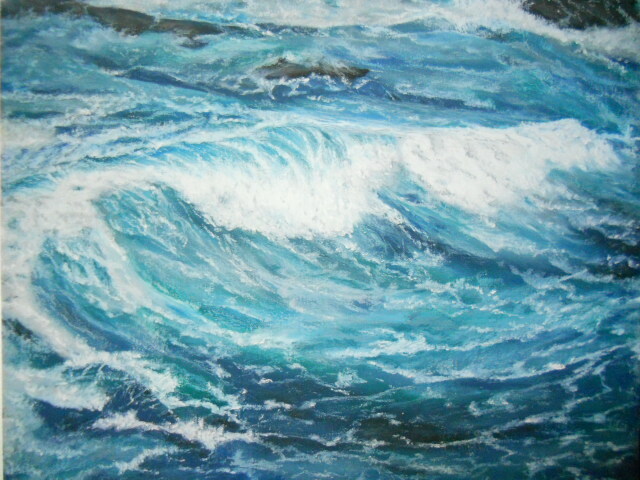 I have seen many oil pastel paintings, but you truly are a master of it! Thank you Maniparna – the colors were gorgeous in the field and the wonderful thing about oil pastels is how vibrant the paints are. Appreciate your thoughts, means a lot. Thank you so much John – really appreciate your feedback and compliment. It was a beautiful scene to reproduce into a painting – glad you enjoyed it.